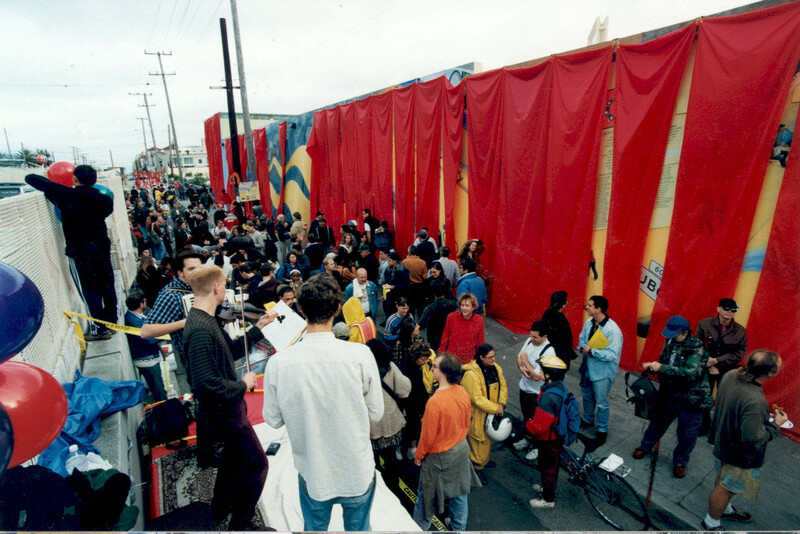 On November 21, 1998, hundreds of strips of red nylon fell on the yank of a cord to reveal the newly completed Duboce Bikeway Mural. Joel, of Thinkwalks, was the project coordinator and producer. Mona Caron was the newly minted lead artist. She has since become murally prolific in multiple countries on many continents. DIY: This event is simply a gathering and see-what-happens. Rain or clear. People seem to be stacking up ideas for musical interludes, short victory-lappish bike rides through the Wiggle, showing photos, giving and selling mementos, etc. We’ll see what happens! 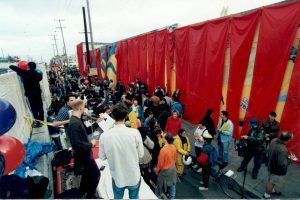 ↪ The mural is at Duboce Ave & Church St, where the N and J streetcars emerge from the Market Street tunnels.